E! News can confirm the 52-year-old was arrested for a DUI in the wee hours of Friday morning in Oregon, as first reported by TMZ. At 1:33 a.m., authorities pulled him over and performed a field sobriety test which confirmed that Thomas was inebriated. He also blew a .11, three points over the legal limit of .08 percent. He was then sent to a detox center so he could "sober up" and be released. This is not Thomas' first encounter with police. Markle Jr. was arrested in January 2017 after he pulled a gun on his fiancée, Darlene Blount, during a heated and drunken argument. At the time of his arrest, Blount reportedly told officials she feared for her life, but she dropped the case the following month. Then, in July 2018, Blount and Markle Jr. got into another fight while under the influence, which resulted in Darlene giving Thomas a black eye. She was subsequently arrested and charged with two counts of fourth degree assault, however Markle Jr. told the Daily Mail he hoped the charges will be dropped. Not long after, the couple told the Daily Mail they quit drinking in the hopes that it would help to get the charges against Darlene dropped. Markle Jr revealed he told the district attorney handling the case, "We're getting couples' counseling, individual counseling and we've drastically just cut alcohol and beer out of our lives." They recently told the outlet that they believed the case would be dropped by February. Blount and Markle Jr. plan to celebrate the end of the saga by holding their wedding in March. News of his arrest comes days after Meghan's older brother announced he extended an invitation to Meghan and Prince Harry to his March wedding. 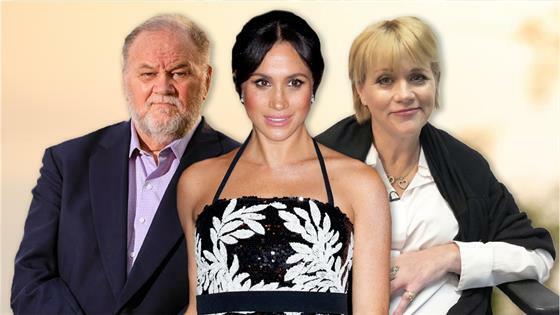 Thomas and his fiancée shared that they hoped their ceremony would provide an opportunity for Thomas Markle Sr. and Meghan to reconcile after months of drama. "Starting out the New Year by bringing our family closer together is definitely on the to-do list — it's very important," Markle Jr. told the Daily Mail. Although, Thomas is doubtful that a reunion will take place. In November, he told Daily Mail, "But if I bet a dollar on [Meghan] coming, I could retire off of that if she did — those are the odds of her coming."